Join us for a day on the Morros and learn which plants grow on each of these volcanic plugs. Ascend one, two, or more. Here are the start times. 7:30 a.m. Islay Hill, 2 miles, 500 ft. gain, moderate. The easternmost of the Morros, with views of ﬁve others. To trailhead, take Tank Farm Rd. east past Orcutt Rd, then south on Spanish Oaks Dr., then east on Sweet Bay Lane to end. 9:00 a.m. Cerro San Luis, 4 miles, 1,100 ft. gain, moderate. 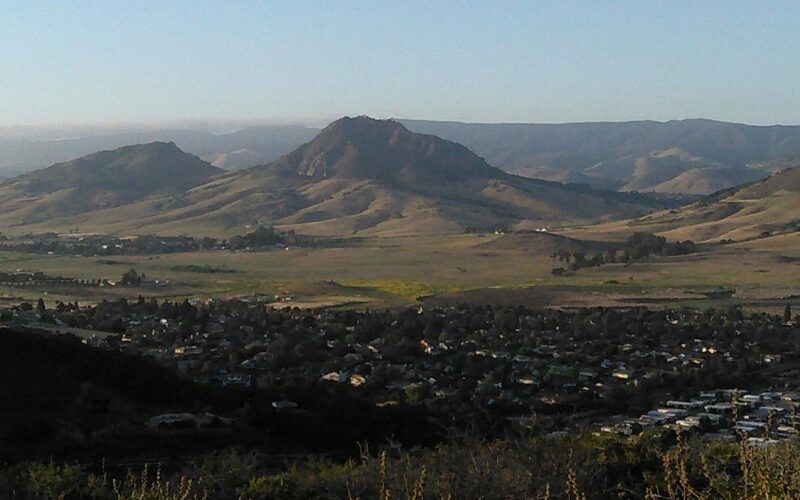 Has knockout views of SLO. Trailhead at the end of Marsh St., just before on-ramp to Hwy 101 south. Lunch (optional): 11:15 am to 12:00 pm, Throop Park, corner of Cerro Romauldo Street and Cuesta Drive, in SLO. 12:00 p.m. Bishop Peak, 3.5 miles, 950 ft. gain, moderately strenuous. Highest of all the Morros. From Hwy 1, go west on Highland Dr., then right on Patricia Drive. Park at trailhead on Patricia Dr. just before reaching Anacapa Circle. 3:30 p.m. Cerro Cabrillo, 2.5 miles, 800 ft. gain, moderately strenuous. 360-degree views from the Santa Lucia Mts. to coastline. Meet at Quarry Trail trailhead on South Bay Blvd, 1.4 miles south of Hwy 1 or 0.4 miles north of Turri Rd. 6:00 p.m. Black Hill, 3.0 miles, 650 ft. gain, moderate. Ocean views from Montaña de Oro north to San Simeon. From South Bay Blvd, drive into Morro Bay State Park on State Park Road. Meet at the parking area on the north side of the road, next to restrooms opposite the boat marina, just east of the campground entrance. Bring water (if hiking more than one Morro, store extra water in your vehicle), lunch and snacks, and dress in layers for changing weather. The day is likely to start and end cool but be quite warm at mid-day. A hat, sunscreen, and sturdy hiking shoes are essential. For more information, contact Bill, (805) 459-2103, bill.waycott@gmail.com . The mission of the California Native Plant Society is to increase understanding and appreciation of California’s native plants and to conserve them and their natural habitats through education, science, advocacy, horticulture and land stewardship. The local San Luis Obispo Chapter, CNPS-SLO, was founded in 1967 and is one of 33 chapters statewide.